Our continuous research and development activities on our products are always giving us more things to demonstrate. This year more than 10 new features were developed and tested and installedin our new products. Some of them are, Self-Managing System, Silence detector, Backup Audio, Integrated Audio Player, IP audio decoder, Cloud Remote Control, 3G/4G USB Modem Support, more compact dimensions, Email/SMS Notification, better efficiency, and lower temperatures. 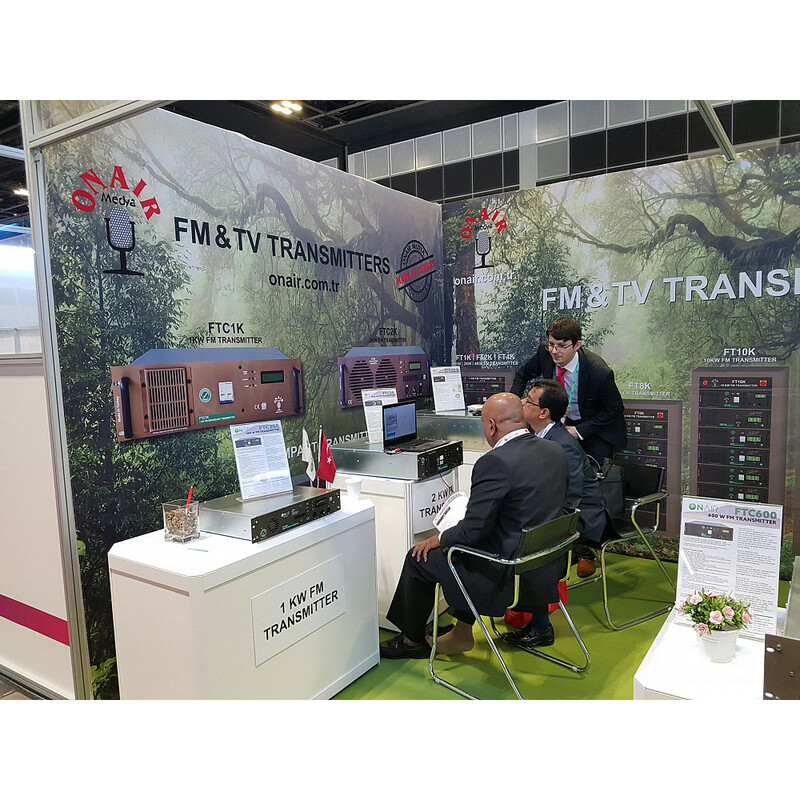 We successfully demonstrated our latest Cloud, RDS, IP audio and efficiency features in Singapore. Our transmitters are now being able to connect to the Onair Service Center Cloud, and are completely manageable over the internet without the need of IP and Port forwarding. Just connect the transmitter to the internet and log in to Cloud from Front keys and you are connected to Onair Service Center Cloud. In this way, you can control all your transmitters from one location, http://osc.onair.com.tr. You can view all information and can edit settings remotely. Our transmitter range has a built-in RDS encoder. We developed a simple web protocol to enable the update of RDS dynamically. And we have successfully demonstrated how radio automation softwares will integrate in our transmitters to automatically update RDS PSN according to played song. It doesn’t matter if just one transmitter or multiple transmitters at multiple different locations, just internet connection is enough to update RDS data on transmitters. Also, our all products now have a Silence detector. The Silence detector will send you an email notification when there is no activity on primary input, and after silence detector can fallback to the Integrated Audio Player to play a simple list of audio files or can play IP Audio streams, in anyway your frequency will not be silent. All our products are developed with efficiency and simplicity in mind. That’s why all our features have an impact on efficiency and simplicity. With more than 50 user configurable settings, our transmitters might look complicated but with the help of the clean and user-friendly interface, everything is simple to understand and edit. We are proud to serve more than 75 countries for 21 years. We would like to thank all the visitors, customers, agents and business partners who take the time to visit our stand.